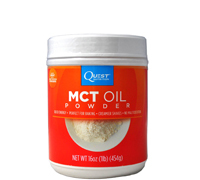 Quest Medium Chain Triglycerides (MCT) powder was created to provide all the benefit of MCTs - a fat source providing you more energy that isn't metabolized the same way as most fats - minus the GI upset that liquid MCTs cause. Most people who can't tolerate liquid MCTs have no digestive distress with our powdered version. Rich, Creamy Shakes, Easy To Bake!